Born in Berlin as a Prussian Jew and the grandson of Moses Mendelssohn during the era of the French revolution, Philipp Veit witnesses many historical events during his life. His mother Brendel Veit divorces her Jewish husband and converts to Catholicism together with the cultural philosopher Friedrich Schlegel. The centuries-old Holy Roman Empire has vanished during his childhood. Philipp takes a different path than the enlightened rationalism and Jewish traditionalism of his famous grandfather. He becomes a Catholic, a Romantic, and a member of the Nazarenes, the school of painters inspired by the Old Masters who hark back nostalgically to the faith and certainty of the medieval world. A German patriot, he fights in the wars against Napoleon. As a museum director, he comes into conflict with his more liberal colleagues and resists the new aesthetics and critical approaches of 19th century “Modernism.” During his last decade in Mainz, he lives to see the founding of a Second German Empire, this time under a Protestant monarch. The many dramatic changes this searcher experiences in the eight decades of his life end up having a stronger impact on his personal development than his many pious paintings would suggest, which focus on the eternal and immutable. At the tender of age of five, “Feibisch” (his Jewish name) is taken away from his father Simon Veit. He is raised by his mother and her new lover Friedrich Schlegel in the town of Jena, in a commune established by a group of early Romantic artists. When he reaches the age of twelve, his mother sends him back to Berlin, as she had pledged to do under the divorce agreement. This agreement also stipulated that she was prohibited from converting her sons to Christianity. Philipp dotes on his biological father, but finds the separation from his mother and stepfather difficult. His Jewish father eventually agrees to let him go away prematurely so that he can study fine arts at the Kunstakademie in Dresden. His aspiration to become a painter is also shared by his older brother Jonas. Simon Veit, the banker, gives his blessing. 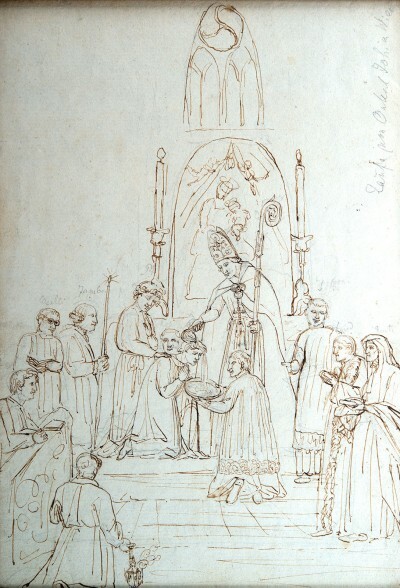 At this point, the mother pressures the boys to accept Christian baptism, and they undergo the ceremony in 1810 at Stephen’s Cathedral in Vienna. As a soldier in the German Wars of Liberation, Philipp becomes friends with the poet Joseph von Eichendorff. During seminal years spent in Rome, he and other young painters form the “Brotherhood of St. Luke,” an association devoted to the religious re-vitalization of art. He and other members of the “Nazarenes,” as this group is later known, are awarded a contract by the Prussian diplomat Jacob Ludwig Salomon Bartholdy, a brother-in-law of Moses’ son Abraham Mendelssohn. From 1815-1817, they paint Biblical frescoes for the ‘Casa Bartholdy’ (the Palazzo Zuccari) near the Spanish Steps. Philipp has to give up his ambition to become a priest after marrying 13-year-old Carolina Pulini, a daughter of the house where his mother resides during the artist’s sojourn in Rome. The baptism of Veit’s elder brother Jonas, who was given the name Johannes. Philipp Veit, 1810 © Private collection. Philipp Veit in a letter to his mother Dorothea Schlegel from 1814, during the Wars of Liberation against Napoleon. His artistic focus consistently remains on the visual representation of stories of Christian salvation. For the Vatican, he paints The Triumph of Religion (1817/18), which shows a female figure holding a cross and sitting amidst Roman ruins, at her feet the tools once used to torment Christian martyrs. In the Villa Massimo, he creates the Paradise Frescoes (1818–1824), inspired by Dante’s Divine Comedy. In 1847, the year before the revolutionary upheavals in Prussia of 1848, he is busy designing a monumental fresco that will ultimately remain unfinished: Wilhelm IV and his House Awaiting the Day of Judgment. 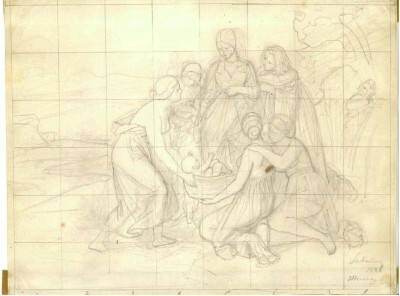 Philipp Veit: The Finding Moses, 1848, drawing © Mendelssohn Gesellschaft. By this time, Philipp has already suffered humiliating defeats in his efforts at resisting the increasingly secular zeitgeist. In Frankfurt, to where he had moved in 1830 with his wife, brood of children, and widowed mother to take up the post of Director of the Städel Institut, the museum’s administrators refuse to accept The Finding of Moses, a painting they had commissioned from him. Furious, he destroys the work. In 1843, the conservative Veit resigns from his directorship, outraged that the museum has acquired Carl Lessing’s Jan Hus at the Council of Constance, a tribute to the Bohemian heretic, and placed it opposite his own programmatic triptych Christianity Introduces the Arts to Germany. Veit reacts to the political turmoil of 1848 by lampooning Parliamentarianism with caricatures and satirical poems. Paradoxically, he also paints a monumental (4.82 x 3.20 meters) Germania for the Church of St. Paul in Frankfurt, where the revolutionary National Assembly is gathered. He depicts this young and vigorous allegorical figure with shattered manacles lying at her feet, the sun of a new era dawning behind her. 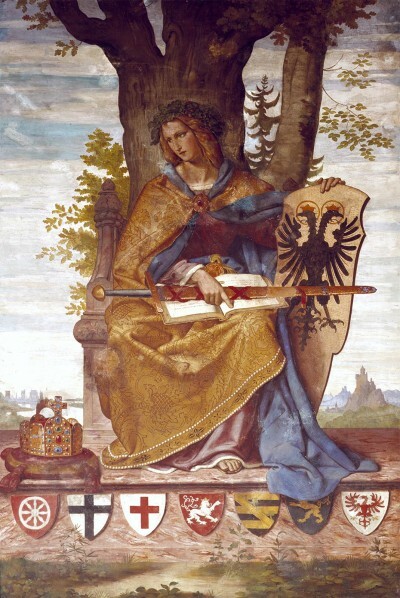 His earlier Germania, painted in the 1830s on a side panel of the triptych Christianity Introduces the Arts to Germany, is significantly less energetic, sitting in front of a gnarled oak, the Prince Electors’ coats of arms arrayed beneath her. 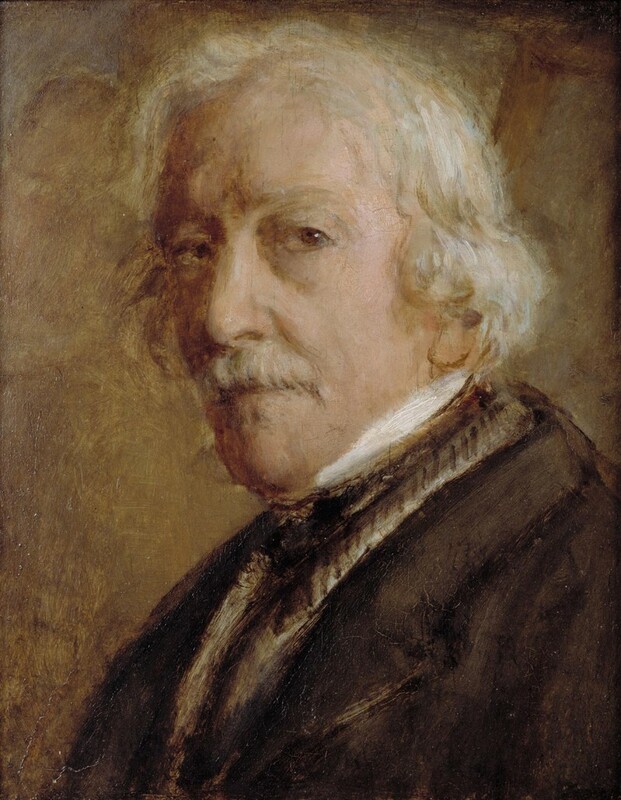 Philipp Veit, Self-Portrait at the Age of Eighty, circa 1873, © GDKE / photo: Ursula Rudischer. Allegorical figure of Germania. She is shown in a more melancholy, introspective version, having removed her imperial crown. Philipp Veit © Städel Museum / ARTOTHEK. In the view taken by Philipp Veit, true art does not aim to reproduce fallen nature – instead, its purpose is to reveal the original beauty that lies behind it, thereby “restoring the Divine image” (Friedrich Schlegel). As the style of many Nazarenes becomes ossified, Veit continues to evolve as an artist, putting more emphasis than his colleagues on capturing a subject’s individuality. His self-portraits mirror the current state of his artistic technique and his perception of himself. We see the dark-haired beau of 1816, a glint in his eyes and fuzz on his upper lip, gazing at us sternly. And we see the silver-haired 80-year-old, his mustache now drooping over his upper lip, giving us a reserved, scrutinizing glance in semi-profile. Contours and color surfaces have become blurred. One side of the face lies in shadow. The chin has become hardened: This man knows what he believes and yet remains a mystery to himself.